A protest, petition and even police involvement has stopped some trees being cut back in a quiet cul-de-sac in Portadown. Residents of Ridgeway Park South vociferously objected to the cutting back of lime trees which line both sides of the avenue. One local resident said outside contractors cut back some trees on March 6, however, she pointed out that under current legislation it is illegal to cut trees or hedgerows between 1st March and 31st August. She said she came home from work and couldn’t believe the contractors were chopping back the trees in March during nesting time. “They said they were searching for nests before they pruned but there was one they clearly missed, Unfortunately, on one of the trees the branches around a thrush’s nest were severely cut back leaving it exposed to the elements and predators. “I understand that the trees need pruned every year but this is the wrong time of the year to do it,” said the resident. She said she voiced concern when NIE had told residents they were isolating electricity on April 25th. Having contacted MLA Doug Beattie they were told the Department of Infrastructure had requested the isolation of the power so that contractors could come back and finish cutting the trees. Residents launched a petition garnering 90 signatures supporting the protection of the nesting birds in the trees. “Everyone agreed that it was too late in the season for pruning the trees as birds were nesting (including NIE workers on site). The PSNI arrived and spoke to the contractors and after a short time the contractors packed up and left. We realise that the trees will need pruned but not between 1st March and 31st August,” said the resident. Residents of Ridgeway Park South said they would like to thank all who helped and supported their protest and commend the contractors for respecting the law. They hoped the pruning will take place after August. 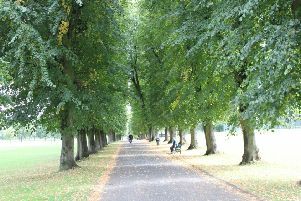 A Department for Infrastructure (DfI) spokesman said: “Works to prune branches of lime trees at Ridgeway Park Portadown is periodically undertaken by the Department for the health and safety of residents in Ridgeway Park. This is to ensure the mature trees do not interfere with overhead NIE power supply cables and to ensure that the trees remain structurally sound. Lime trees, if not pruned, may be susceptible to falling if there are high winds so this reduces the potential for them to fall and cause damage to the public road or adjacent properties. “The Department instructed the contractor to undertake this work in late January. The works however had to be delayed until March as NIE required a power shutdown of adjacent overhead cables.